How does the nature inspires us about the optimal geometry? The bees create their honeycombs with precision engineering, an array of prism-shaped cells with a perfectly hexagonal cross-section. If you blow a layer of bubbles on the surface of water, they instantly rearrange into three-wall junctions with more or less equal angles of 120 degrees between them. You will never find a raft of square bubbles. There is great explanation that the law of nature, which automatically optimized in a self-organized system, which approximate to hexagons, read more from Why Nature Prefers Hexagons (2016). I remembered the pleasure of reading The Computational Beauty of Nature. The topics in the book taught me an important lesson, development can be divided into immediate needs for professional life and spiritual food for enriching life. 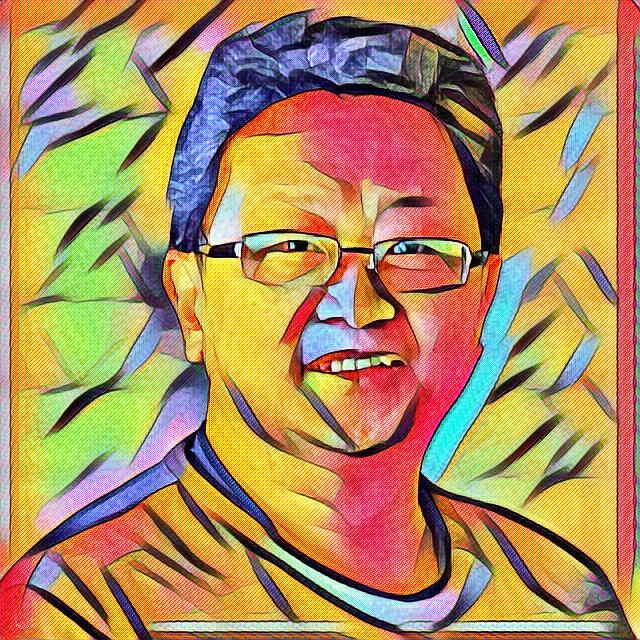 Spatial Tessellation belongs to the spiritual side of my computing adventure, because spatial representation and reasoning are my on-going research thesis. I sense the pure fun of the spatial computing and try to bring my understanding closer to nature. You will see a working interactive demo in this page; subsequently you can checkout the demo code yourselves to play. On the practical side of tessellation, many strategy games have good reason to choose the hexagonal tiles as their game board. One of the main advantages is that the distance between the center of any tile and all its neighboring tiles is the same. In term of strategy, this equidistance property enables consistent strategic moves (see the right diagram below, move to all connected cells is 1 (green arrow)) When comparing with the rectangular grid, the diagonal move is unfair because it takes 1 step but the equivalent orthogonal move takes 2 steps (see the left diagram of rectangular grid, the diagonal move (red arrow) is equal taking 2 orthogonal moves (green arrows)). I was wondering if anyone has any thoughts on marrying a hexagonal tile system with the traditional geographic system (longitude/latitude). I think it would be interesting to cover a globe with hexagonal tiles and be able to map a geographic coordinate to a tile. This is a topic belongs to The Promise of Discrete Global Grid Systems, which is beyond my speculation. To understand Hexagon Coordinate System and it’s mathematics, the excellent website that comes to mind is Amit’s game programming information and his collection of interactive explanation on Hexagon Grids. This article will simply use the results explained by Amit. Unlike the familiar Cartesian Coordinate System that we learned since our high school days, which has only 1 type of grid layout. Hexagon Coordinate System comes with 4 types of grid layout! For this article’s world map, I choose to use the “odd-r” horizontal layout, which shoves odd rows right. 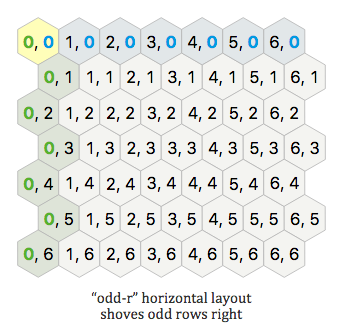 You are free to choose other hex layout type but the mathematics is slightly different. See later, the hexlib.js implementation supposed to support all 4 layout types. D3 comes with a Hexagon Binning package, useful for aggregating data into a coarser representation for display. Rather than rendering a scatterplot of tens of thousands of points, bin the points into a few hundred hexagons to show the data. 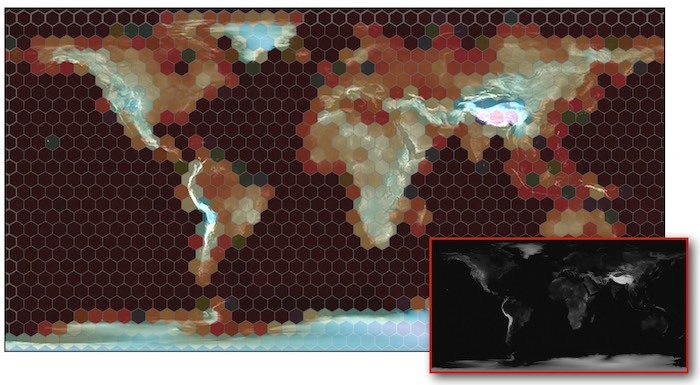 The hexbin is chosen to use color encoding of the average height of the world’s terrain height image (the smaller black & white picture). For all the terrain pixels that fall within the same hex bin, the average pixel value is calculated and mapped to a color, where the gradient map from red (is low) and blue (is high) altitude. Unfortunately, the 2D hex cylindrical map projecting onto a 3D spherical map is not perfect (no matter what you do, the projection will be distorted), as you can see towards the north/south poles, the area of the hex cells are distorted. May be the interested reader can enhance the code? The full demo source code can be checkout from the companion D3HexMap github repo. More explanation will come after the demonstration. Try to move your cursor over the hex grid to view the globe rotated to center (the red dot) on the highlighted hex cell. The hex grid interactivity is provided by hexlib_ui.js, which is carefully extracted and cleaned up from the hexagon explanation page at http://www.redblobgames.com/grids/hexagons.html, making the code has minimal dependencies so that the script can be easily reused on other pages. The hex grid diagram is later called with addHexCoordinates() from hexglobe.js function makeHexOddR(); this is how the interactivity of the mouse movement is detected. If the mouse is over the hex grid, the selected (row,column) cells are classed with highlighting, and the globe’s updateGlobe() function is called with the selected cell (lon, lat) for the globe rotation and view. create a “odd-r” hex grid, with the given hexagon pixels size, and the width, height of the reference terrain image. for each hex, map the average pixel value to a color, according to it’s gradient range. The globe is constructed from world-110m.json topojson file, then the hex grid is projected onto the globe surface. A timer is setup to check if the globe’s projection has been updated; consequently, the global will be rotated and redrawn to center at the given (lon, lat) location. The main visualization index.html can be checkout from here. Try to move your cursor over the hex grid to view the globl rotated to center (the red dot) on the highlighted hex. Inspire and tell me any further modification and application of the supplied code! Please enjoy your hexagonal journey. Also, take a look at vraid/earthgen, it uses hexagons (plus a few pentagons) to generate a simulated earth surface and includes source code (see planet/grid/create_grid.cpp).